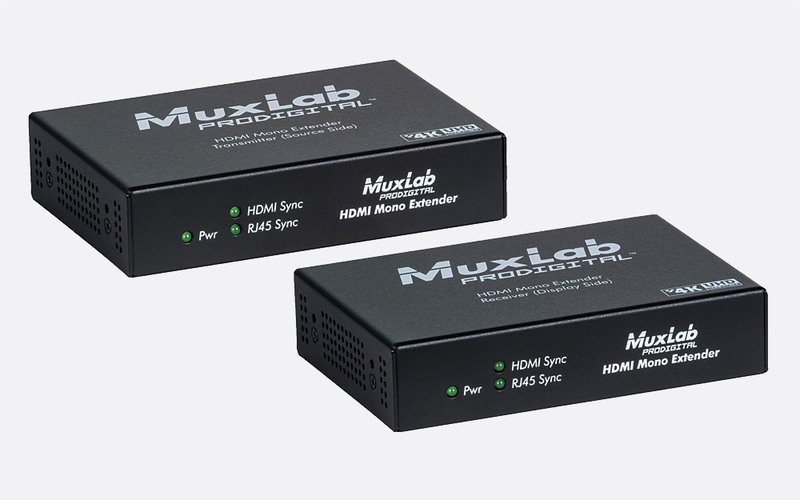 MuxLab HDMI point to point video extenders have been designed to facilitate the transfer of data from compatible HDMI equipment over Cat5e/6 to distances up to 100m. Typically used for digital signage, commercial AV solutions, classroom projectors and medical information systems. 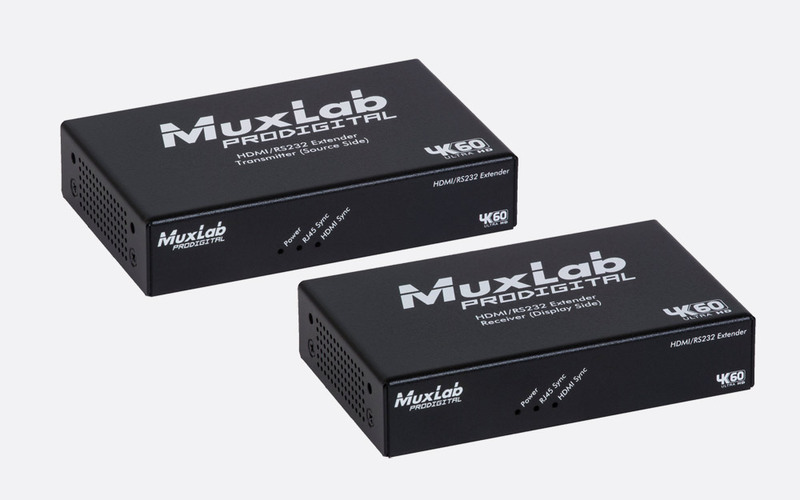 This kit comprises of transmitter and receiver units and can offer point to point HDMI 1.3 and HDBaseT data transfer up to 100m with video resolutions up to 4K. the 500450 supports the 3D features of HDMI 1.4 as well as remote control via the included 500998 IR emitter and 500999 IR sensor. Both transmitter and receiver have three LEDs on the front panel to indicate power, HDMI sync and RJ45 sync status. Rear panels have 12V DC power supply connections, RJ45 link connection (output on transmitter, input on receiver), HDMI connection (input on transmitter, output on receiver), and 3.5mm jack socket for infra red hardware. Dimensions: 114 x 76 x 32 (HxWxD) mm. Weight: 1.2kg. 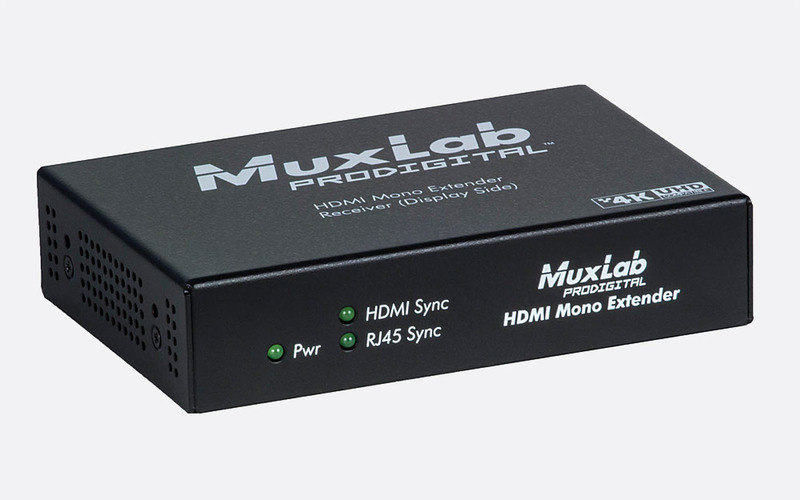 This HDMI 1.4a kit includes transmitter and receiver units and offers the transmission and reception of 4K at 24/35/30Hz and 4K, 60Hz over Cat5E/6 unshielded, twisted-pair cable. 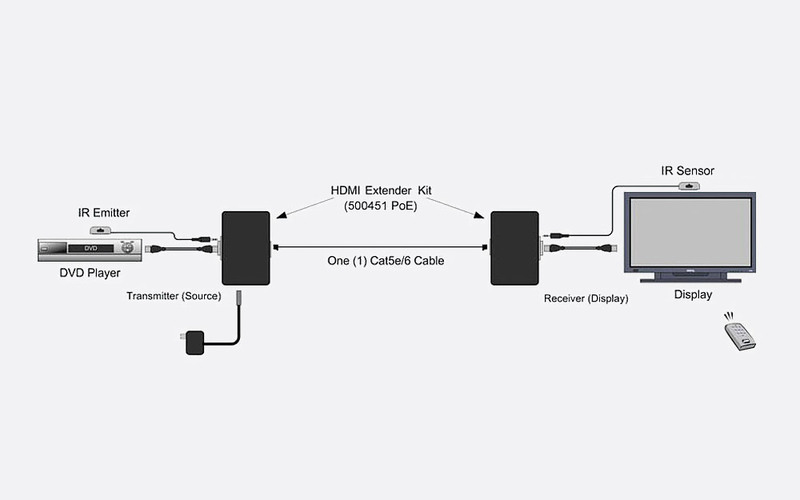 4K, 30Hz or 4K, 60Hz HDMI video sources can be transferred up to 40m, and 1080p HDMI video sources up to a distance of 70m in a point to point configuration. One 'carrier-wave' IR sensor and one IR emitter are included in the kit and bi-directional IR pass through is supported. Both transmitter and receiver have three LEDs on the front panel to indicate power, HDMI sync, and RJ45 sync status. Rear panels have locking 5V DC power supply connections, RJ45 link, HDMI connection (input on transmitter, output on receiver), and two 3.5mm jack sockets for infra red hardware. Dimensions: 112 x 76 x 25 (HxWxD) mm. Weight: 0.6kg. This receiver only is an optional addition to the 500451 kit. This has the same properties as the 500451 kit however in addition both transmitter and receiver support POE and POC power. The transmitter and receiver in this kit are compatible with 500451 hardware. This receiver only is an optional addition to the 500451-POE kit. 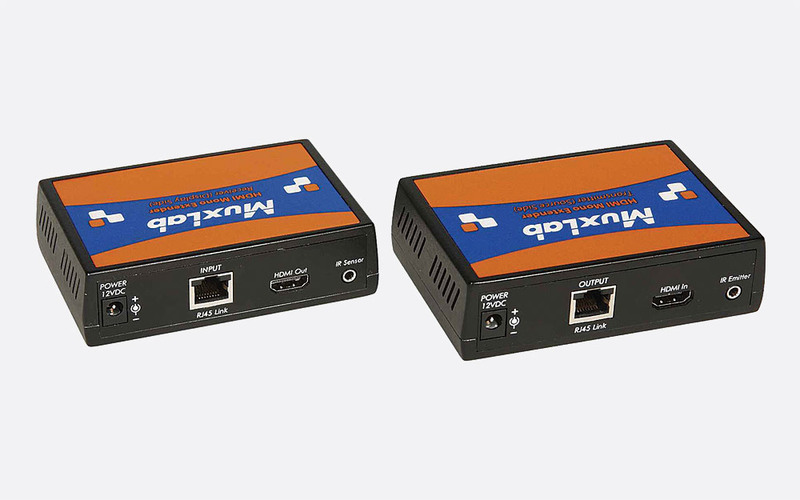 This HDMI/RS232 extender kit allows the transfer of 4K, 60Hz up to a distance of 40m, or 70m for 1080p resolution via a single unshielded twisted pair Cat5e/6 cable. 4K signals are supported with resolutions of 24/25/30/60Hz, as well as full 3D support. The kit consists of one transmitter, one receiver, one IR emitter, one IR sensor, and a single power supply - both receiver and transmitter support POC therefore the TX can power the RX or vice versa. 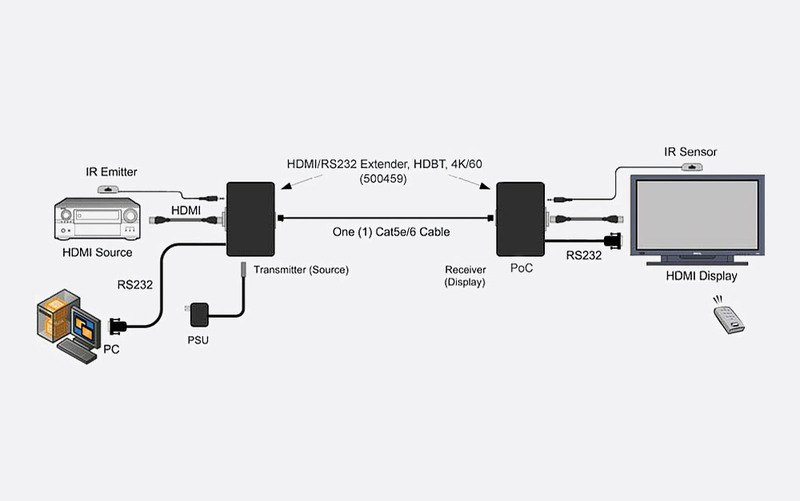 HDCP 2.2 compliancy with RS232 and bi-directional infrared pass-through. The front panel hosts a blue power status LED, RJ45 sync status LED, and HDMI sync status LED. The rear panel hosts all I/O connectivity including 2.1mm locking 12V DC power supply input, RJ45 link connection, 3.5mm jack sockets for IR sensor and IR emitter, 3-pin terminal connector for RS232 remote, and HDMI connection. A single DIP switch allows the user to switch between 'Service' (for firmware update mode) and 'On' (for normal operation) states. Both transmitter and receiver have the same connections with the exception of the HDMI connection which is an output on the receiver and input on the transmitter. Dimensions: 120 x 73 x 25 (WxDxH) mm. Weight: 0.79kg. 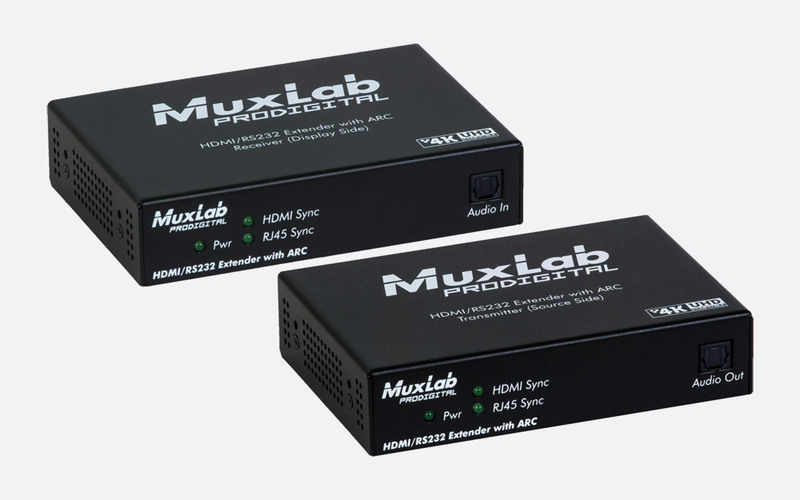 This HDMI/RS232 extender kit with ARC, HDBT and UHD-4K has been designed to transfer HDMI signals to a maximum of 100m, at 4K, 24/25/30Hz (4:4:4) or 4K, 60Hz (4:2:0), or 1080p resolution to a maximum of 100m via single UTP Cat5e/6 cable. The benefit of this kit, which includes one receiver, one transmitter, one IR sensor, one IR emitter and two 5V DC power supplies, is the inclusion of audio return channel (ARC) which allows the receiver to return an audio signal from a device such as smart TV back to the transmitter and in turn output to an external audio system. This ARC signal can be sourced via the HDMI or TosLink input of the receiver. 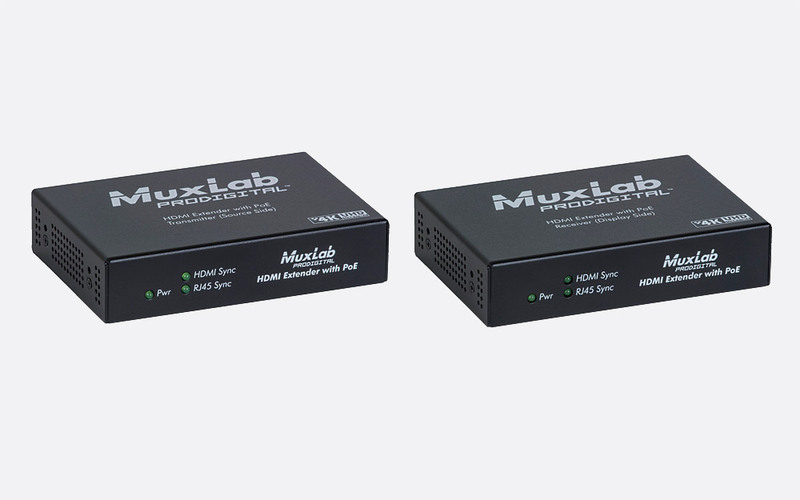 The 500458 supports HDR and is HDCP 2.2 compliant as well as offering RS232 remote control and bi-directional infrared pass through. The front panel hosts green LEDs to signify power status, RJ45 sync status, and HDMI sync status, along with a TosLink connection for ARC audio out (transmitter) or audio in (receiver). The rear panel hosts all other I/O connectivity including 2.1mm locking 5V DC power supply input, RJ45 link connection, 3.5mm jack sockets for IR sensor and IR emitter, serial connection for RS232 remote and HDMI connection. Both transmitter and receiver have the same connections with the exception of the HDMI connection which is an output on the receiver and input on the transmitter. Dimensions: 112 x 76 x 25 (WxDxH) mm. Weight: 0.6kg.